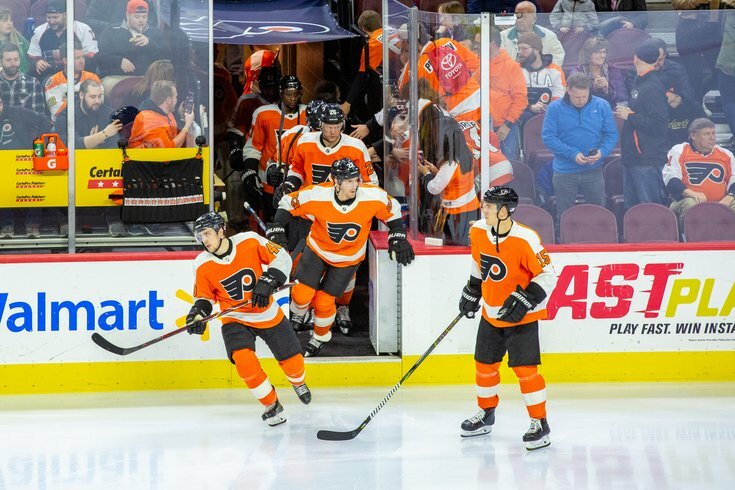 The Philadelphia Flyers take the ice during a game against the Arizona Coyotes at the Wells Fargo Center in South Philadelphia. It's kind of ridiculous how perfectly the calendar is shaking out for the Flyers. Still red hot, at 8-1-1 in their last 10 games, the Flyers have played themselves from the cusp of a legitimate lottery chance at the No. 1 pick to a legitimate chance of making the playoffs. They are currently sitting at 63 points. This week will be the most important week of the season. The NHL's trade deadline is next Monday, and between now and then, Philadelphia will need to decide if it wants to sell (and ship off players like Wayne Simmonds, Radko Gudas and others), stand pat, or bring in some help for a final push. There are two teams they need to leapfrog in the standings: the Hurricanes and Penguins. They play both of those teams this week. They also play Tampa Tuesday evening (the top team in the East), a team rumored to be among those interested in trading for Simmonds. Wayne Simmonds is the biggest name to watch between now and next Monday because he is one of the most tradable assets the Flyers have on their roster. The 30-year-old winger is on an expiring contract and is due a big pay raise. The best way for Simmonds fans to keep the winger they've loved watching for so many years? Win this week. If the Flyers can get points in all three of their big consequential games, they'll probably try to make the playoffs. If they fall apart, they may be double digits behind the last Wild Card spot in the East with 20 games remaining. After their 7 p.m. home tilt against Tampa Tuesday night the Flyers will play Carolina in Raleigh on Thursday before returning home to host the Penguins outside at the Linc as part of their highly anticipated Stadium Series game.